It can seem counter-intuitive to a mother to remove a baby's winter coat when the temperatures outside are plummeting. 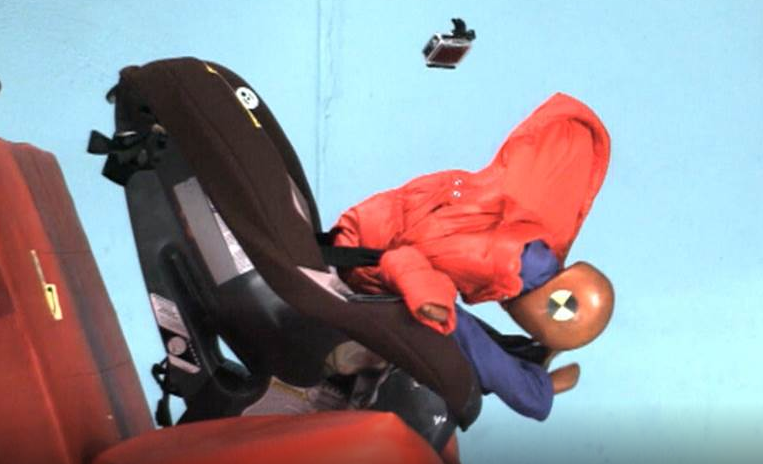 However, leaving a winter coat on your child while in a car seat could cost them their life. The problem is the thickness of the coat. It may seem like the straps are tight, but with the padding of the coat they are dangerously loose, which could cause your child to be ejected from the car seat in the event of an accident. So what should you do if it's cold outside? Strap in the child without a coat on, then place the coat or a blanket over them to keep them warm. If you see someone doing this, don't be afraid to speak up (politely) and show them this video! Education and awareness could save a baby's life!